Hi all, thought you might like to see some work on a recent ongoing commission. 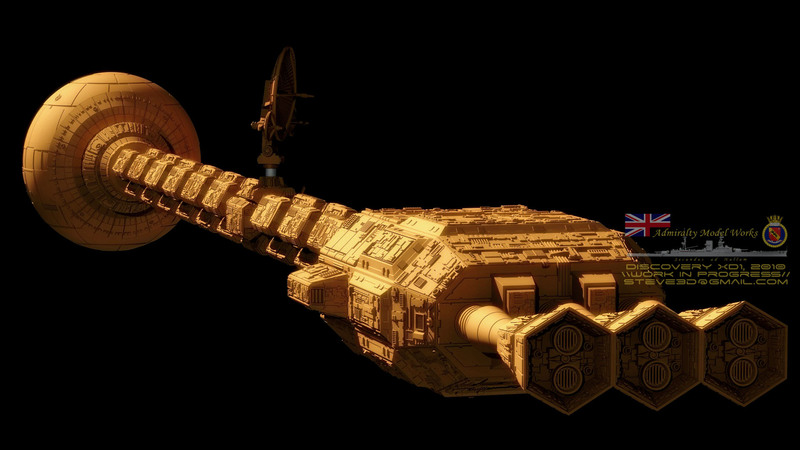 This is based on the 2010 version of the famous "Discovery" deep space exploration ship from 2001. 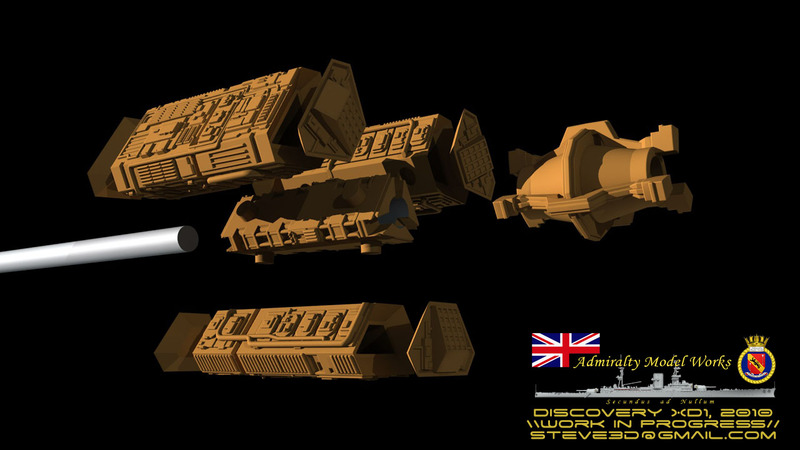 The model is being built specifically to be produced in resin by the awesomely skilled bods at http://www.admiraltymodelworks.com/ and will be available as a kit later this year. 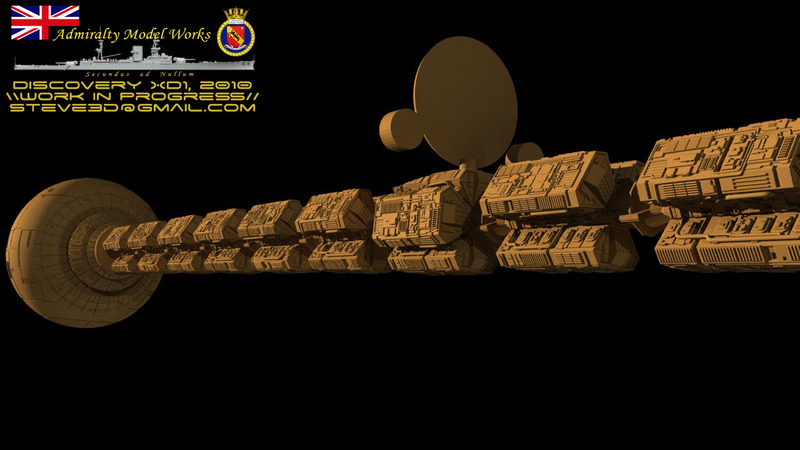 The completed real model will be approximately 22 inches in length making it one of the largest kits i've worked on. Very cool to see work from 2001 and 2010, wherever one puts the Discovery in! Great artwork, hope to see more! Excellent work mate. I'm curious to know if the resin model going to have the work pod bay interior? And yes,dont forget to put a long tube in the physical model like in the last photo!!!!! Very clean! I'm interested in hearing about the modeling requirements specific to 3D printing. hmm.. doesn't look like enough room for the gravity block, looking at the doors and podbay image..... i know its like the Tardis... Looks excellent sir! 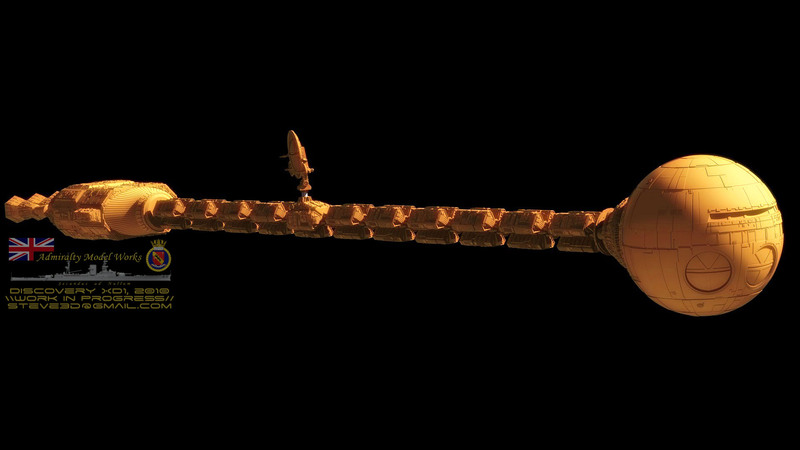 Other resin model-makers have discovered that a large Discovery needs a metal spine to keep her from bending in Earth's gravity. 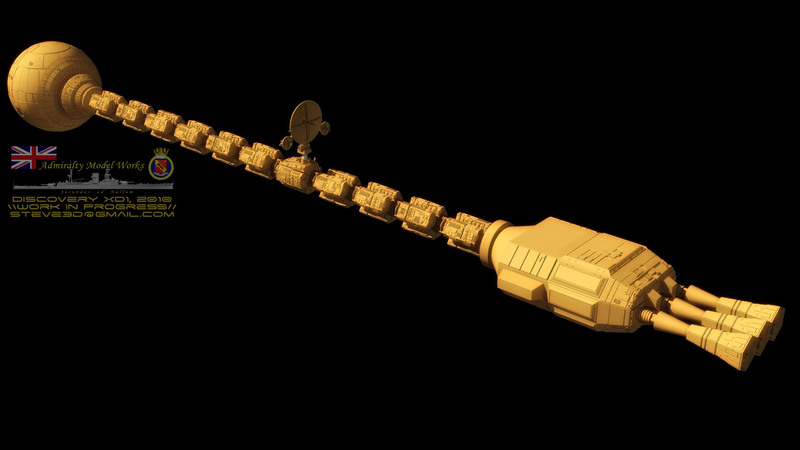 Never fear guys, the kit will come with a steel rod core, as depicted in one of the renders with a white tube. all the core peices will slide onto that like a greebly shishkebab. Wow, impressive ...Excellent work ! I always loved everything about the production design of this film...Syd Mead is simply a design genius. Great job on the Discovery Coolhand! 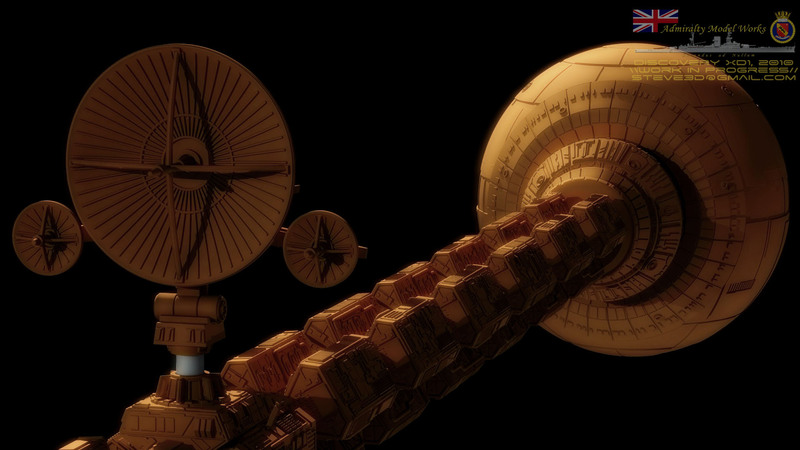 I've modeled the Discovery twice, once in C4D and once in Animation:Master. I have the C4D Discovery here available in the downloads section. The one that I did in Animation:Master, had the Pod Bay and Cockpit interiors. I've also modeled the Pod (also available for download here). Funny thing about the Pod in 2010. It shouldn't have been there. There were 3 Pods. 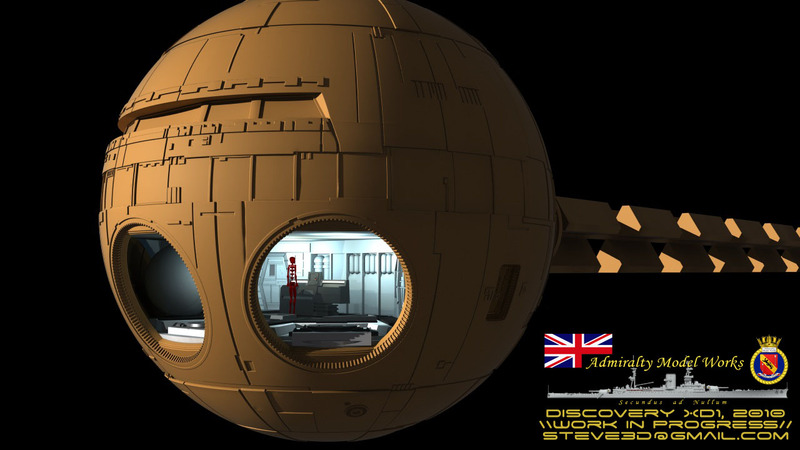 Poole's Pod was lost in deep space when HAL took control of it to kill Poole. Then there was the Pod used by Bowman in his rescue attempt of Poole. It's back hatch was ruined when the explosive bolts went off. And, the Pod should have blown away from the Discovery from the explosive bolts going off. That leaves the last Pod that Bowman used to go through the star gate. That leaves.... zero! 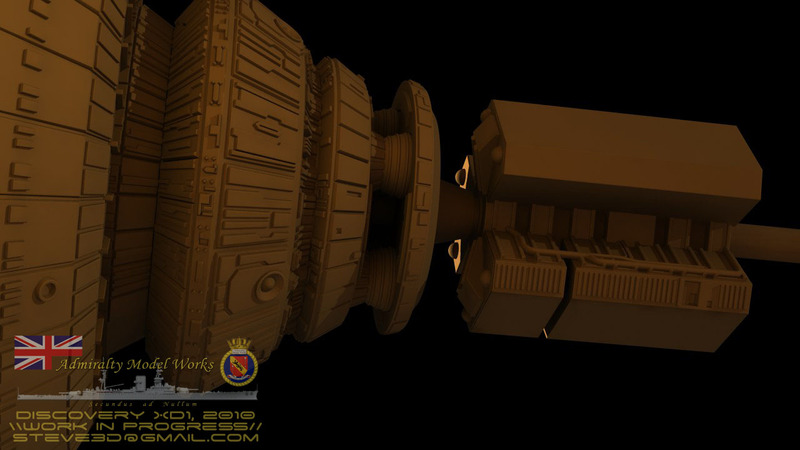 After having modeled the Discovery, Pod and Pod Bay, and paying very careful attention to the reference photos and screen captures from the 2001, there are a lot of discrepancies between 2001 and 2010 in the models and sets. Oh well. If you aren't looking for those types of things, you wouldn't notice them. As a 2010 fan, I'm really looking forward to seeing your Leonov model. I've tried twice to make the Leonov, but I alwasys get stuck on things. The Discovery looks great. Keep it up! David, Leonov even beat my mighty fellow Sensei, Brickhead, who modelled the arguably definative CG 2001 discovery and in preparation has given me all his Leonov references plus his semi-complete model, (thankyou john! :cool:) though i'll largely be working from studio photos and screencaps from the film. It's a challenge i'm looking forward to, and building for this sort of specification really ups the complexity in many ways over making a pure cg model, even if you can't down to the exact level of fine detail that you find on the studio models - though i try and get as close as possible. Anyway, its certainly a favourite ship of mine and many others. and one that gets even more screen time than Discovery in the movie. I will hopefully begin that one fairly soon. I'll probably keep posting 2010 work in this thread and edit the title, so stay tuned. Update time, antenna completed + more on the reactor and engine stems. Now that is just simple cool!! I did a post on one of my Blog's recently highlighting some of the differences between the interior of the 2001 Discovery and the sets used in 2010 !! 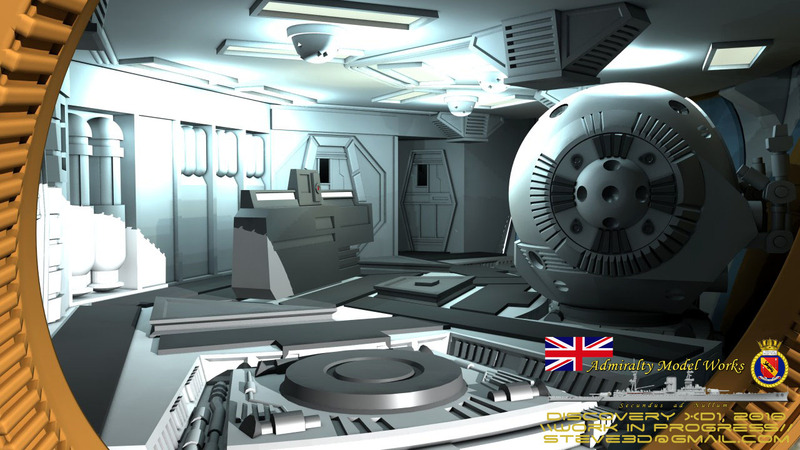 The interior is actually pretty close to the original, especially from a purely modelling POV, the most significant difference in the pod bay is the test bench, which as you surmise is at least partly modified to accomodate a chunky display. Shame they didn't duplicate the flat panels which are one of the things that keeps 2001 looking so fresh, but other than that from a purely modelling POV, and at this scale, there's little difference. There are far more differences in the exterior, and its been important to identify and duplicate those changes. All the times I've watched 2010 and I didn't even think about the fact that the pod shouldn't even be there !!! I'll have to rework my blog post ! To me the 2010 sets also look different because Hyams lit them with diffuse lighting, they're a lot more soft focus than the shots in Kubrick's film !! Coolhand, you never fail to inspire me whenever I decide to check out the forums every other year or so Excellent work. Good Lord Steve! Thats brilliant! That is one sweet looking ship. This is awesome ... all that detail ! wow ! I just couldn't get my head around the lack of info for the multi engine layout. I hope you have solved this problem. What you done to date looks fantastic, to say the least. I'm curious to know were your at with your poly count on this. Good luck on the Leonov, if anyone can do it, it's you.